The Great War is coming. I’m not talking about whatever Game of Thrones season 8 has cooked up, but the reaction to it. This might out-rank Star Wars: The Last Jedi as the one thing people will argue about for generations to come about whether it’s any good or not. That’s not my opinion, it’s the one of Arya Stark herself, Maisie Williams. Ending such a beloved show is always going to garner a massive emotional response, both good and bad. It’s great that Maisie Williams is already aware of that because, as we saw from The Last Jedi, some of the feedback can be uncomfortably vicious. 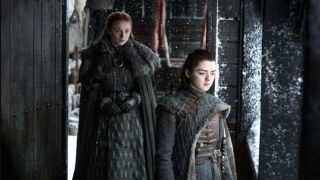 Thrones has built up a lot of goodwill over the years, though, so, even if they don’t stick the landing, it’s not going to be the end of the world. Reading between the lines a little, the show might go into wish-fulfilment territory at some point (will Cersei finally get her comeuppance?) and it’s going to have some divisive moments. Possibly even a definitive winner of the Game of Thrones, who knows…? For more of the here and now when it comes to Thrones (or should that be past? ), check out our Game of Thrones season 7 review. If you're looking for the best deals this side of Braavos then your first step should be here: the best Game of Thrones merchandise.